What's the point of leaving the tail on shrimp? I love a good shrimp scampi, or shrimp and grits, or shrimp fra diavolo. But what is the deal—[Jerry Seinfeld voice]—with serving these dishes with tail-on shrimp? Peel-and-eat shrimp: Sure, leave the tail on. It’s in the name, after all. Fried shrimp: Yeah, the tail forms a little handle to make it easier to eat by hand. Cocktail shrimp: Same deal. But restaurants have to know that most people who ordered shrimp scampi aren’t going to crunch through the tail portion, so why is it even there? Yes, this is a minor quibble. If the dish is delicious, I’m probably not going to have my night ruined by a handful of shrimp tails. But so much thought goes into plating food these days that I’m baffled by the presence of these irksome little crustacean bits. Before I can dig in to a forkful of creamy pasta and juicy shrimp, I have to put down my fork and knife, touch the buttery shrimp, pick off the silly shell-tail, and then put it… where, exactly? Unlike mussels-with-frites or peel-and-eat shrimp, I’m rarely given a separate bowl to discard the shrimp tails, which end up collecting like so many transparent toenails at the edge of my plate—hardly an appetizing prospect. I mean, what. is. the. deal. I take my grievance to Carl Galvan of Chicago seafood supplier Supreme Lobster. Carl, I ask, why do chefs leave tails on the shrimp if I’m just going to pluck them off? Interesting theories, I think, but nothing conclusive. So I keep digging. Maybe it has something to do with locking the flavor inside the shrimp? Paul Adams, senior editor at America’s Test Kitchen, says yes, shrimp shells are quite flavorful and can impart that flavor into the surrounding dish—shrimp stock, the shrimp meat itself—if it’s cooked long enough. Okay, I see his shrimp emoji point. But I still push back a little: The shrimp tails are annoying when I’m trying to eat with a knife and fork. Hmm. Deformed, floppy piece of shrimp vs. ease of eating said piece of shrimp? It turns out the question of pasta dishes with tail-on shrimp is one of pure aesthetics and presentation, not flavor or laziness. That knowledge stirs something almost existential in me: Do I expect a dish at a restaurant to be presented in the way that is easiest for me to eat, or do I mind a bit of artistry? 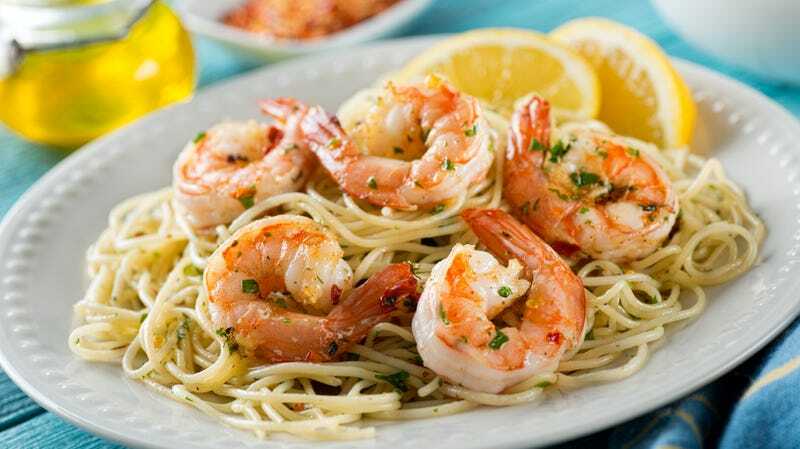 I still think it’s silly to have to touch saucy shrimp to remove their tails before enjoying my dish of pasta, but maybe next time I order the shrimp scampi, I’ll snap a photo first. Then the tails will have served a small purpose.